Thai food is famous for seeking to combine five flavours perfectly: salt, sweet, sour, spicy and bitter. One dish might lean more heavily on one flavour, but another will balance it. This is a pretty explosive idea for a Brit who’s been brought up on yummy, but quite bland dishes, like baked potato and tuna mayo, and pasta, and pie. Please note, this list is totally subjective and is just the tip of the iceberg when it comes to what's on offer here in Thailand. I apologise in advance to any vegetarian readers, too - this isn't the most veggie-packed list! Look at that crispy fried egg! Beautiful. Krapow is absolute Thai comfort food. Thai Holy basil, garlic and chilli briskly fried with ground meat or tofu - quick and delicious, it's one dish most Thais know how to cook in their sleep. It should come with rice that's a little bit tackier than normal jasmine rice, sort of half way to sticky rice. On top of the rice sits a perfect crispy fried egg. Pop the yolk over the rice and enjoy the resulting deliciousness. Originating from the South Thailand in the Muslim community, this curry is one of the fanciest foods in my list. Because it takes a long time to prepare, and uses an incredible host of herbs and spices, it's often only served on special occasions in Thai households. Cardamom, cinnamon, cloves, star anise, cumin, bay leaves, nutmeg and mace join dried chili peppers, coriander seeds, lemongrass, galangal, white pepper, shrimp paste, shallots and garlic to make curry paste. This paste is first fried with coconut cream, and then meat (usually chicken), potatoes, onions, fish sauce, tamarind paste, sugar, coconut milk and peanuts are added. Quite a complicated process, but definitely worth it. This very popular dish originates in Isaan and Laos and is not to be missed. Lime, coriander, mint and chili bring a serious zing to any ground meat. 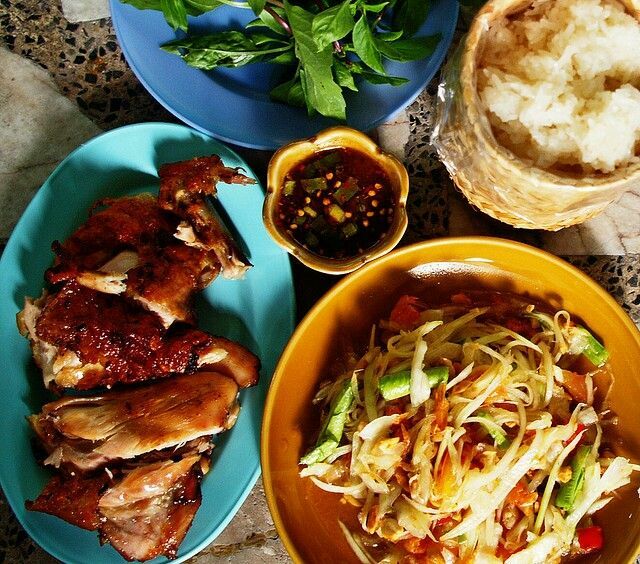 Laab moo (pork) and laab gai (chicken) are the most common. There's a very delicious version made with raw fermented pork which is uber northern, but if I eat it I'm sure to drink some rice whiskey (lao khao) alongside, which Thais recommend to kill off any bugs lingering in the meat. Same goes for raw buffalo laab which honestly is so delicious, and kind of reminiscent of steak tartare. When I go home to England, I dream of this meal. So I get that this is kind of cheating because I'm sneaking in three foods in one. But this is like the holy trinity of Thai streetfood - three simple dishes that complement each other so perfectly it's as if they were made with each other in mind. Gai Yang is grilled chicken, fatty and juicy with crispy sweet skin. Khao Niaow is of course sticky rice, dense and flavourful, great as streetfood because you can eat it with your hands as you walk. And Som Tum is papaya salad made with grated green papaya, lime, fish sauce, peanuts, tomatoes and green beans - made to order, so you can choose how spicy you like it. This is the lunch of your dreams. There are many, many wonderful ways to eat Plaa - fish - in Thailand, but this is definitely worth a mention. In this dish, the fish is steamed in a marinade made with limes, coriander, chilli and garlic. It's light and refreshing. The fish is super tender. It feels a little healthier than many Thai dishes so it's great if you're feeling like you've overdone it a bit (which is basically all the time, since every meal is so good it's hard not to stuff yourself way past satiety). The veggie option. I love this mild and flavourful curry with a slightly unfortunate name (although better than anything cooked with green pumpkin, which, since green is 'see kiew' is called 'fuk kiew' - hilarious). It's made with pumpkin that's cooked slowly with coconut milk, turmeric and kaffir lime leaves until it's soft and tender and mushy. It's wholesome and comforting and I could eat it every day. I haven’t seen this much on the street but our cook at Chai Lai, New, makes it really well. So I’m going to say it’s a thing. Ok, I'm definitely cheating with this one, too. Interestingly, Thais don't tend to eat dessert that often - something I find hard to understand since there's so many wonderful sweets to be found, of every colour and texture. Some are made with coconut milk and meat, others with young rice powder, and some with egg yolk. I love them all but you've really got to try these: Khao Lam, sticky rice mixed with coconut milk, poured into bamboo pieces and roasted in the fire; Khanom Krok, tiny coconut pancakes served with sweetcorn or taro; and Sang Kaya Fuk Tong, pumpkin custard. And Nam Khaeng Sai deserves a special mention. When I was little my siblings used to tell me about their horrible experience of eating Ice Kacang in Singapore - it sold itself as 'all your favourite goodies' at the bottom of a big pile of flavoured ice, and they were horrified to find that the 'goodies' were mung beans, sweetcorn and grass jelly. Nam Khaeng Sai is like the Thai version of Ice Kacang but I love it! You fill your bowl with palm toddy, grass jelly, water chestnuts, taro balls, sweetcorn, basil seeds and and green worm things made out of rice flour (I think? ), top the assortment with ice and drown the lot in neon sugar syrup and condensed milk. It's amazing, and it makes you feel like a kid again. I also really love Kluai Buat Chii, bananas stewed in coconut milk and served hot. Great in winter. Vibrant, crunchy, chargrilled, spicy - this dish is everything. Nam Tok is a recipe which uses fish sauce, lime juice, shallots and mint leaves, ground roasted rice for crunch, and ground dried chillies - quite similar to laab, but this time the meat is grilled. The word Nam Tok means waterfall and I never understood why that had any relevance to this dish, so I spent a little time on google. One theory is that the meat makes the sizzling sound of a waterfall when it is ready to be removed from the grill and sliced - another is that there is still 'water' (blood) in the meat when it is served. I think I prefer the former explanation. I've been a big fan of Khao Man Gai, or Hainanese chicken, for a long time, but only recently tried Khao Ka Moo on a roadtrip to Mae Hong Son. As with Khao Man Gai, it's simple and wholesome and relies on slow cooking the meat until it's really tender. The pork is stewed in a broth flavoured with Soy sauce, chilli, ginger, vinegar, cinnamon, star anise, Chinese five spice, and palm sugar. The meat is served over rice with an egg, also cooked in the broth, a chilli sauce, pickled greens, and a bowl of broth. A snack which is just as much fun to make as it is to eat. These are like little green flavour bombs. Miang Kham is sold with its component parts unmixed and it is your job to put everything together. First, you take a betel leaf as use it as a wrap. Chunks of lime, ginger, chilli, shallots and raw garlic, a few tiny dried shrimps, some toasted coconut flakes, and chopped peanuts all go inside. Then add honey or a salty-sweet dollop of sticky sauce made with palm sugar and fish sauce and wrap it all up. Eat in one go - after all, the name Miang Kham translates to "one bite wrap"! Happy eating from one foodie to another! 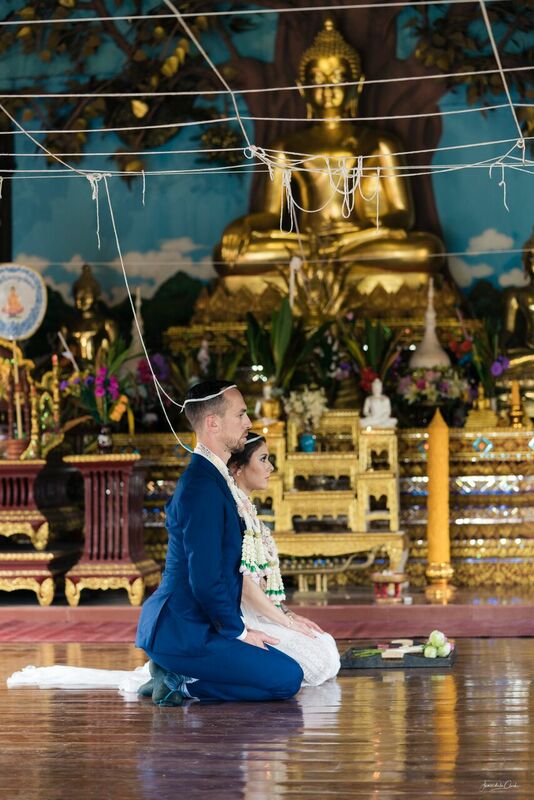 Chelsea and Ben tie the knot at a Chiang Mai temple. This beautiful couple was game for every adventure. Chelsea and Ben decided to get up before dawn to watch the sunrise at one of the most sacred temples in Chiang Mai, Wat Doi Sutep. 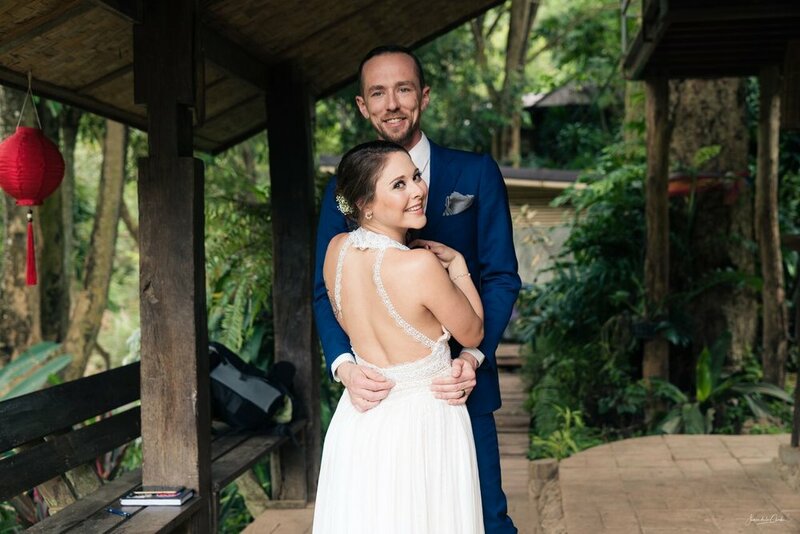 After a traditional Buddhist blessing for good luck and happiness they shared their vows at a jungle waterfall. 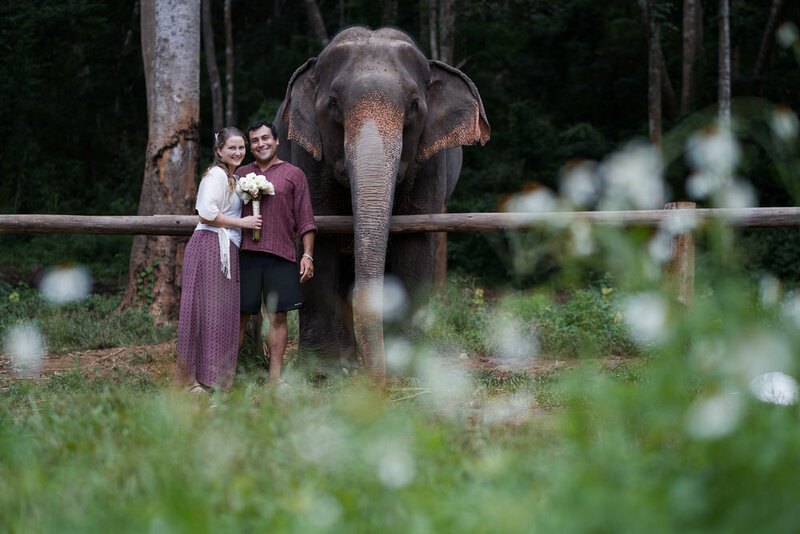 They ended the day hanging out with elephants in the jungle at the Chai Lai ecolodge. Chelsea and Ben we wish you many many years of love and laughter! We are so happy you found each other. Timing your travel: when is the best season to see Thailand? For those of us in the west who are used to a temperate climate, the tropics' seasonal pattern may feel confusing. Is the rainy season really that rainy? Is the cold season actually cold? At Chai Lai we regularly recieve enquiries from guests asking when is the best time to come and visit us here. This guide is here to put your mind at rest and help you make the right decision. Widely understood to be the most pleasant and beautiful season to travel in South East Asia, the period between November and January is cool in the mornings and evenings and wonderfully sunny in the day time. Predictably, the luxury of such a pleasant, reliable climate will cost you, as airlines cash in on travellers' desire to see Thailand at its best. 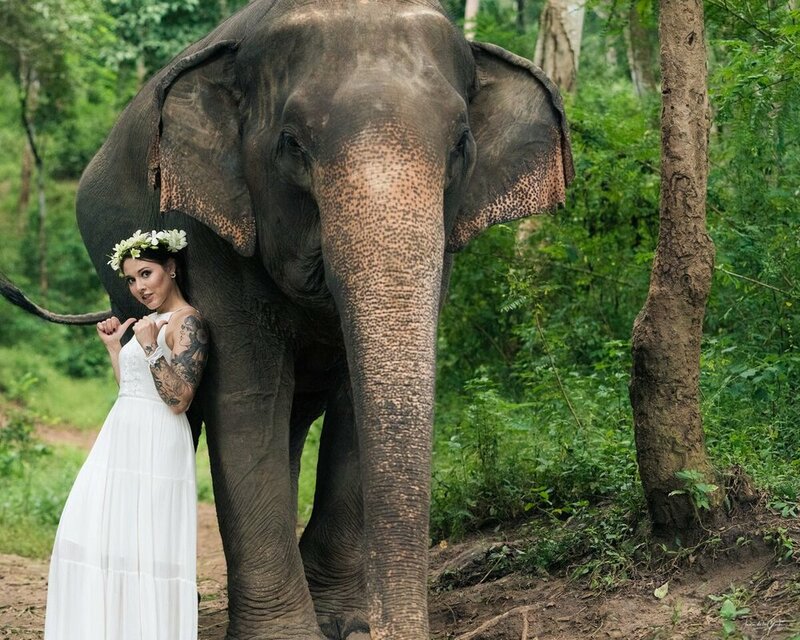 Return flights from New York to Chiang Mai will set you back over a thousand dollars. The magical festivals of Loy Krathong and Yi Peng fall in November, so you may want to plan your holiday to include these celebrations. 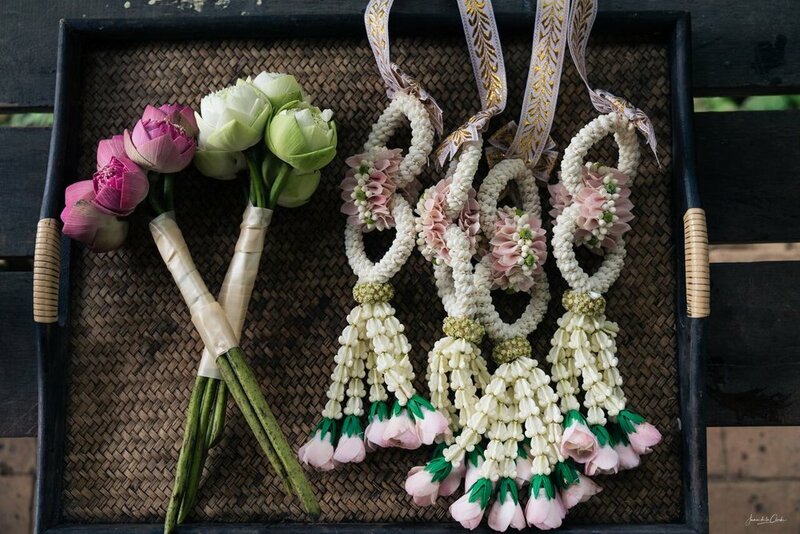 Chiang Mai is the place to be for Loy Krathong as thousands of locals head to the banks of the river Ping to release candle-studded floats onto the water, representing their wish to let go of the past and welcome future joys into their lives. Cold season provides particularly great driving weather. Roads are dry, views are clear, and you won't get too unbearably sweaty in your protective clothing. Intrepid travellers choose this time to do the Mae Hong Son Loop by motorbike. This incredible drive of 600km with over 2000 curves takes a minimum of three days, but can take upwards of a week if you choose to wander off route to any of the other surrounding sights - including a highly recommended detour to see us here at Chai Lai! If a great tan is a priority for you, hot season is the time to go to Thailand! Sun is an absolute certainty between March and June, so you don't have to worry about rain ruining your plans to hit the beach. Party islands like Koh Phangan and Koh Samui are always busy, but if you prefer the slow life there are much quieter beaches on Koh Chang, Koh Muk or the Surin islands. Back up north, Chiang Mai is hot and smoky. This season, particularly March, is when many farmers burn their fields and since Chiang Mai is in a bowl-like valley, it collects the smoke as drifting south from Mae Hong Son. If you have health concerns or asthma, better to head to the islands where the sea breeze keeps the air clean or escape the heat by retreating up into the mountains. Otherwise, get your camera ready - the smoke in the air makes for very dramatic sunsets. The heat is relieved in April with Thai New Year. Visitors from all over the world descend on Chiang Mai to celebrate this festival, known as Songkran in Thai. The streets fill with crowds of people dressed in bright colours throwing buckets of water at each other and ducking and diving to avoid being shot by water guns. It's basically a city-wide, three-day-long party! Expect rain! Rainy season demands flexibility, as your plans may be rained off at a moment's notice. Whether this is with an epic three day storm or a short, sharp afternoon downpour is at the whim of the weather gods. You might have three days of beautiful sunshine - or you might hit the tail-end of a typhoon. Still, this shouldn't stop you. Flights are cheap and there are fewer tourists clogging up the hotspots. And if you love beautiful misty mornings, lush green spaces, and dramatic skies, rainy season is for you. Pack an umbrella and leave your fancy shoes at home: if you are prepared to get a little muddy and damp, you will have plenty of adventures. In reality, this stunning and fascinating country is a wonderful place to be at any time of year. Each season brings its own challenges and benefits, but forewarned is forearmed. As long as you are prepared and pack the right kit, you'll have an amazing time regardless of when you choose to book those tickets. Enjoy this article? Share it with your friends - pin the image below!